A while back I wrote about the texting ban and how little I thought about it. It turns out I didn’t have to wait long for an answer to my original question about effectiveness of the law and decreasing accidents while increasing safety. If they see more than 10 taps, police assume the driver is sending a text message, according to Lisiecki, who heads the North Huntingdon department.It’s unscientific, but it’s just one method police have found to determine if a driver is violating the state’s 8-month-old ban on texting while driving, a law many officers say is ineffective and nearly impossible to enforce. And there is the answer, the law just does not work. I have addressed this before but the reasons still stay the same. In addition, it is sort of the flavor of the day as we see more and more pushes to control what those in charge cannot control. LaHood told a group of doctors, advocates and government officials in San Antonio that the problem of accidents connected to cell phone use is a “national epidemic.” The National Transportation safety Administration reported 3,000 traffic deaths attributed to distracted driving last year, many blamed on cell phone use. He said he was not too concerned about people who eat or apply makeup while driving because “not everyone does that,” Reuters reported. “But everyone has a cell phone and too many of us think it is OK to talk on our phones while we are driving,” the secretary was quoted as saying. Every time I tackle this subject I like to peruse opinion and fact to see what has changed. I don’t consider myself an expert in the field but one who spent enough time living it to understand more than the average driver. What amazes me is how those we trust to make laws to protect us, rush to a conclusion to satisfy other issues then the cause at hand. A good indication that the problem has not been solved is that the law cannot be enforced. Again, for me it is not an issue of laws being bad. It is one of when a problem is being tackled, that time is taken to explore and solve the core root of the issue. If we deem an issue of public safety so important as driving, why don’t we have carefully crafted laws that make sure the root issues are addressed. Instead, we have a system of poorly crafted mandates that tell the public to do certain things that only serve as band-aids. Moreover, that is not to say that band-aids don’t serve a purpose, but when the band-aid can’t stay in place and crumbles under pressure, the band-aid has failed. Yes, you will have some government figure trot out and quote numbers of people who have been cited under the anti-texting law, but how many people were let go when push came to shove. In addition, how many accidents were prevented, even better the question is how much did accidents rise due to this law. The public should not be a guinea pig for experimentation, especially when we have the hyperbole of life at stake. Now when this issue came up again for me, I did not simply want to rant again about the subject. Therefore, it is time to present my solutions to the issue of driving safety. The minute you tell someone they are doing great, they stop trying. The government message of driving slow or the speed limit equates safety needs to go. I have addressed this before, but it bears repeating. As humans once we, feel we have obtained, think we have made it to the top spot we stop. This truth bears out in life in so many areas. In a career the minute you have done it all, you want to stop and move on. Yet the odd thing is we do not apply this logic to driving. Instead, we have a system that tells drivers that once they achieve the goal of getting a license their training is done. And then to further compound the issue the system tells the public that simply doing a few things right, gives you a passing grade. Take for the example the issue of driving the speed limit. As I pointed out before, the common thought of safety means that one should go the same or below ( <= ) to be the safest. The problem is the list of variables that surrounds the process of driving. Variables that people have less control over then they think. Moreover, in doing that one thing right does not ever mean you will be successful. Yet we keep pushing the logic on doing one thing right, which in turns lulls people into a false sense of security. Instead, we should be pushing drivers to think about the process of driving as a whole and not select areas that fit the message of the moment. This brings up the perplexing issue of laws. The one thing that bothered me the most about driving truck was that no matter what I did I was always wrong. Now this may sound weird coming from me, especially after reading the last section. However, the truth is the problem I had, was having to know Federal, State and Local laws when it came to driving commercially. Moreover, the more I drove from state to state; I became aware of how parts of the driving regulations were not enforced with safety in mind. It is simple, when you are talking about a visual activity like driving; designing laws without that aspect in mind is foolhardy at worst. It seems many times traveling on stretches of roads that the speed limit can go up and down for no good reason. It is simple, a driver should be able to look out the window of their vehicle and be able to tell the speed limit by view, along with other factors. More perplexing is that most states have speed limits for areas without signage based on surroundings. Yet repeatedly I am reminded that the reason governance of a road changes is simply the result of jurisdiction and not for safety. In addition, that would be why the current system is not contusive to safety. When it comes to driving there should be one rule of law and not the fragmented system we have now. Instead of a fragmented set of DOTs, have one Federal DOT that governs all the state DOTs. 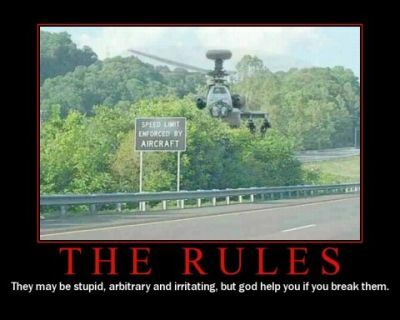 That is have one set of laws that govern the roads. One set of guidelines for setting rules for road signage, layout and design. Moreover, one rule of law that governs all types of vehicles that wish to use the roads, from cars, trucks to bicycles. Either that or make drivers obtain license endorsements for the states they wish to travel through or border. That is if you want to travel from PA to NJ with a PA License, you must have a NJ endorsement on your license proving you know the rules of that state. Safety is not about revenue, when you make the roads safer revenue goes down. It is not a hard equation, the more drivers in compliance with law the less people are breaking laws. Therefore, revenue, fines and penalties, comes down, and insurance premiums drop, body shops make less money as people have less and less accidents. Not as many police will be needed for enforcement. And yet this is a bad thing as it would seem. Revenue and safety goals are hard to put side by side because the two have a hard time existing together. In fact, to increase revenue off traffic fines you have push people to make bad decisions. For example, a common speed trap is decreasing a speed limit by 10 miles per hour. Therefore, a 55 will become 45. In of itself this is not a bad thing, what is bad is not warning or guiding the driver towards this change, so they can react accordingly. Nevertheless, many times I have come across stretches of roads where the speed limit will drop with no warning. If the idea of speed limits is safety, what end does it serve to drop a speed limit with no warning? In fact, the very purpose of signage in driving is to warn or guide drivers of features of the road they cannot see. It is to serve as note for the driver to get ready and prepare. If you take out the time to prepare then you are not serving safety. In addition, I know there will be those quick to say a fine is about punishment but let us take into account what punishment means. Punishment, in terms of law, is meant to be discouragement and guidance towards doing what society has deemed the right thing to do. If a fine is deemed to be a way of deterring a wrong behavior why is the punishment not applied equally? This is not about class warfare, but the question is still very valid: If I make $300 a week and you fine me $150 for a ticket you are disciplining me in a very disproportionate manner to a person who makes $1000 a week. Why is the punishment scale not scalable, in terms of fine, to administer equal punishment to perpetrators? Beyond that, we have to ask the question why the systems first way to resolve bad behavior is monetary and not education. Now I know the quick response will be that we have a system in place, which is points, but does this really work? In addition, I ask the question being, as some offenses don’t carry points, or allow drivers to negotiate away the points when going to court. If you want safety then the first step should be education, meaning all forms of punishment should apply the point system without reprieve. Meaning all traffic violations should carry some point punishment that cannot be negotiated away. And here is where the system runs into problems. Driving is a necessary part of life for people who live outside the city. Yet our current system does not seem to do any kind of job addressing this issue. In fact, when the issue comes up we see it mostly brought up with younger drivers. In addition, as with the issue of my first change, treating every driver the same is the issue. If someone cannot drive to standards we deem necessary in society, then why do we differentiate by age? In the last couple of years, we have seen more and more legislation, especially in Pennsylvania, aimed at younger drivers. Yet we have seen none that address other driver ages, especially those who are older. This brings up the question of: Should we have laws that do not address all drivers the same way? If someone cannot drive, does age really play a role in punishment? We don’t have laws that say people must drive, as it is deemed a privilege, yet we treat younger drivers as if they are the age group who need more training. Would not it make more sense to treat everyone who drives the same? How does someone who starts to drive at 36 differ from one who drives at 18? Both are inexperienced, need training, and need to prove the same set of criteria to receive a license. How can it be justified that we automatically become ready for anything at the magical age of 18, but before then we are not ready. Moreover, if that is the case, then do we need to let those under 18, the privilege to drive? Does reaching an adult age, automatically become a gauge of better judgment? Further to the point, if we deem those under a certain age are not experienced and apply a set of criteria to their ability to drive, why we do not apply a similar set of criteria to drivers as they age. Is the assumption the system takes that older drivers make better sound decisions correct? Again, one set of standards that deem whom is road worthy and who is not, not a bureaucracy that is a myriad of paperwork that says those born under the moon on the second term of the wolf young must have more training and those who do not and are exempt. One thing I could never understand driving professionally was how I had to learn a set or rules that seemed to pertain to no one else. Now on the surface of it, that makes sense. If I am transporting hazardous materials I get that, I should be trained and certified to do so. That way if I run into problems I know how to handle all possible known problems. However, why if I need a CDL to drive a bigger vehicle with more weight and have endorsements for things such as air brakes, why then are these requirements not required for all? I did a quick search for the guidelines governing Recreational Vehicles and found this page with a grid of all the states laws with links. Again, if the issue is safety, how does not having one set of laws to govern drivers not make sense? Yes I will acknowledge that there are always needs for variances in laws where necessary. However, when it comes to safety is the fragmented system we have really serving that goal?